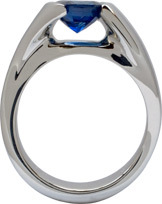 In this 14K white gold engagement ring a 2.14 carat round sapphire has been set. 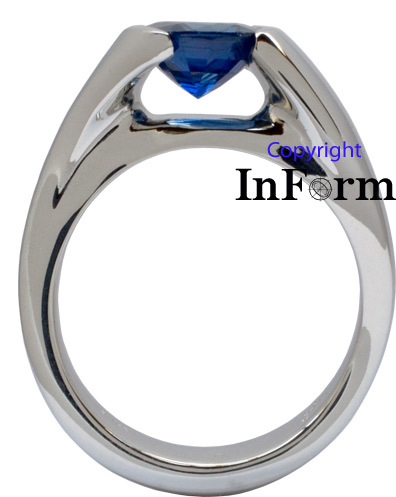 The stone has been channel set in such a way that it shares much of the same appearance as a tension set stone, leaving a large amount of space surrounding the sapphire. The ring has a slight S-curve that provides a playful appearance and the two slightly undulating sides interact in an interesting manner with the wedding bands that were made either to accompany the engagement ring or to be worn together on their own. 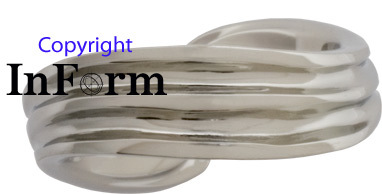 ***Please note that this ring could be made of other colors of gold as well as platinum or palladium. When inquiring about this ring, please make reference to jlngau34 and provide a general idea regarding the desired ring and stone size. The telephone number and tab to initiate an email are located at the top of the page. Or if you'd prefer to send an email from here, the address is farley@artwork-inform.com which you can click on to initiate an email. 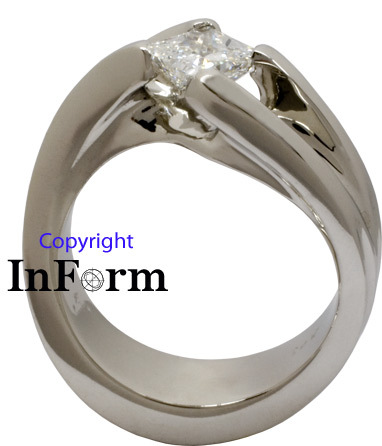 While I don't make tension set rings, the resulting appearance of this white gold engagement ring (and actually nearly all of my engagement rings) shares many similarities. At the same time, it doesn't have the assorted problems associated with tension setting.